A rare but up-and-coming alternative to wooden humidors is the use of acrylic. 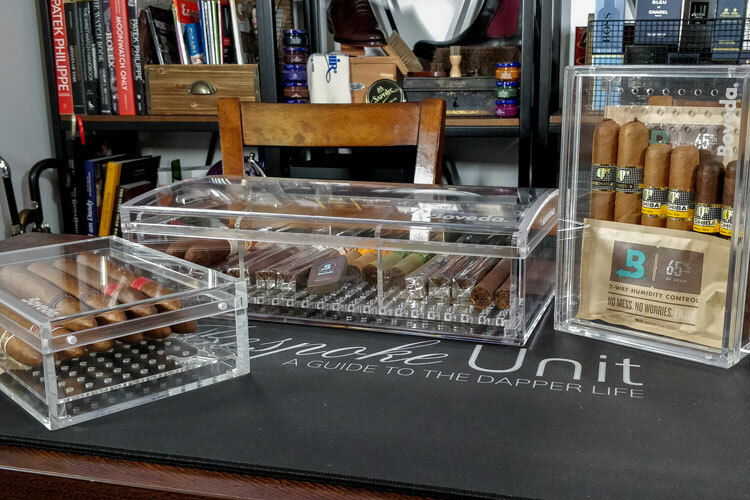 While it’s still rare to find good quality acrylic humidors, we’ve established this guide to introduce you to the modern cigar storage solution. 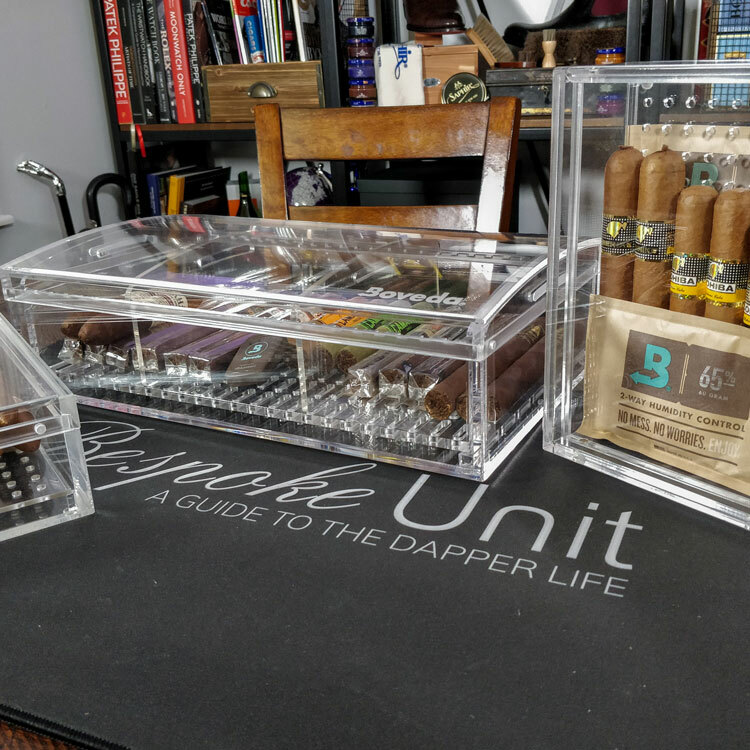 Why Buy An Acrylic Humidor? You can use the links above to jump ahead. 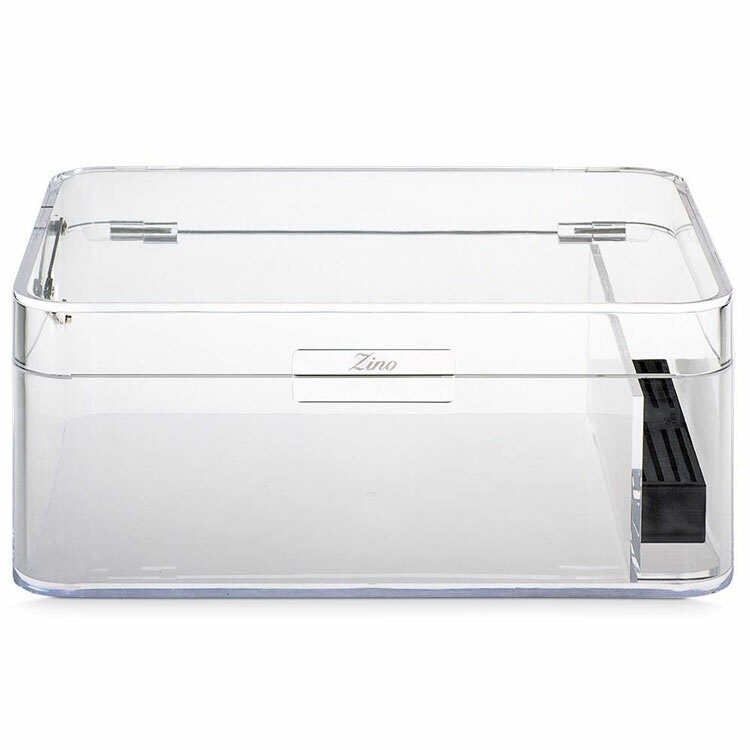 You can also head to the menu below to see the best rated acrylic humidors. 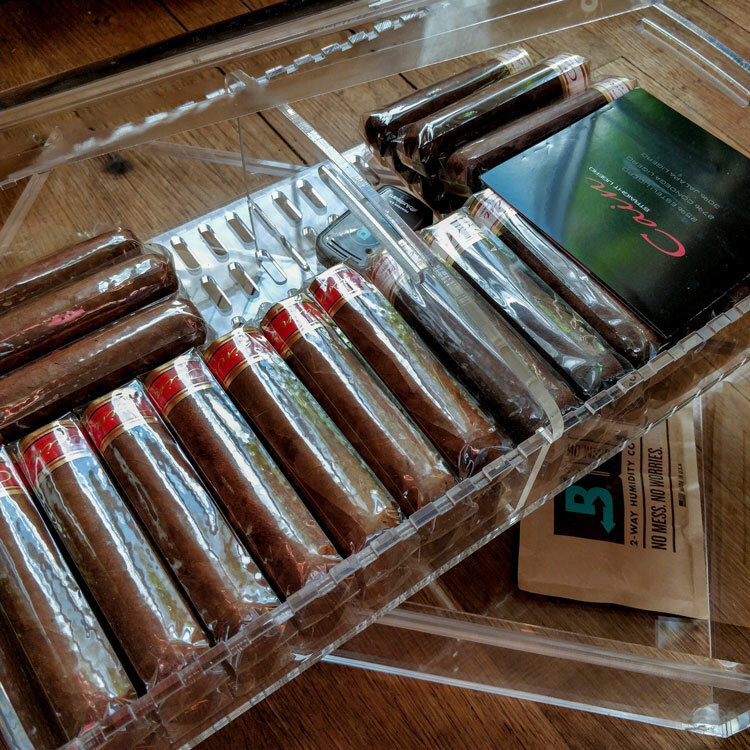 What Are The Best Acrylic Cigar Humidors? As you’ll later learn in this guide, acrylic humidors are low-maintenance storage solutions for cigars not unlike tupperdors. However, they’re considerably more presentable than their DIY ancestors and present themselves as a modern alternative to cigar storage. Unfortunately, there are still too few major brands constructing acrylic humidors. However, we’re confident that there will soon be a trend thanks to Boveda’s own stylish acrylic humidors. While glass may seem like a more elegant choice, it’s very fragile and quite heavy. Meanwhile, acrylic is a lightweight and convenient material. Similarly, most acrylic materials contain additives that prevent degradation under UV light. This also provides them better UV absorbing properties. However, they still won’t filter it completely as you’ll learn below. If you’re looking for easy, carefree cigar storage that offers better decorative value than a tupperdor, an acrylic humidor may be for you. 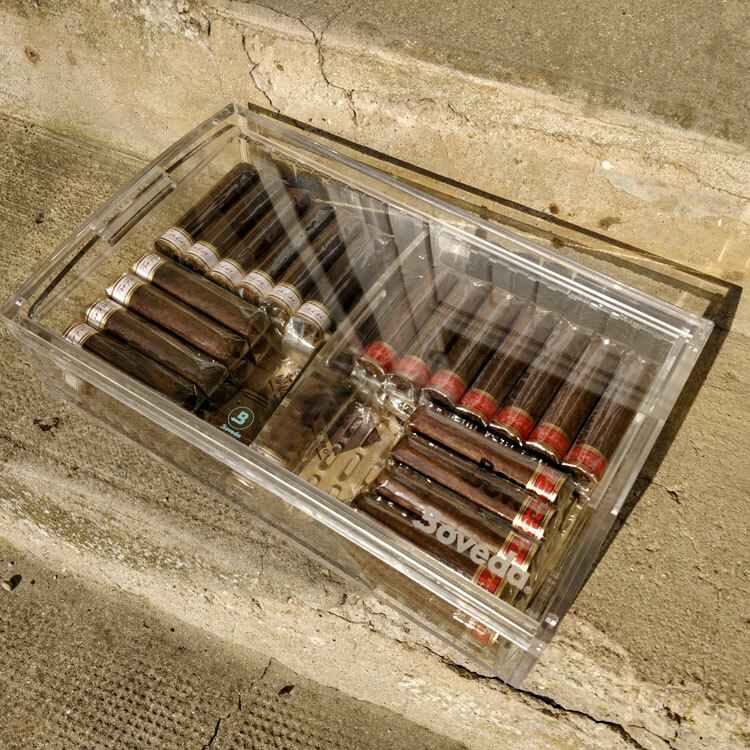 The first and most significant benefits of acrylic as a humidor material is that it provides an airtight seal. Being a non-porous material that doesn’t absorb moisture, it won’t require seasoning unlike wooden humidors. Of course, a truly airtight seal largely depends of how well the opening closes. Therefore, it’s even more important to buy a quality acrylic humidor. 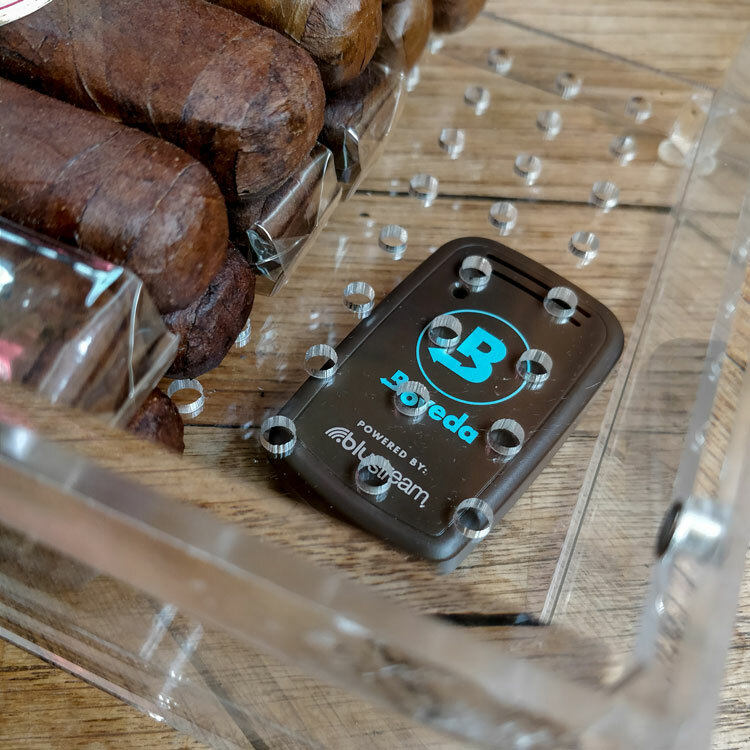 However, we’ve noticed that the Boveda packs in our acrylic humidors lasted an entire year before needing to be replaced. Furthermore, acrylic humidors are quite lightweight compared to most storage solutions. Generally, they weigh about the same as tupperdors. Yet, they’re much more attractive and can be used as a modern display piece in a room. As they’re quite light and relatively attractive, it makes it easier to pass it around when receiving guests. Unlike plastic, acrylic is a very robust material. While plastic turns yellow, becomes brittle and cracks over time, acrylic is very hard-wearing. After all, acrylic is the material used to make airplane windows. Finally, you’re able to admire and consult your cigars without ever opening the humidor given that the acrylic is transparent. This means that you can periodically check the hygrometer without disturbing the well-balanced micro-climate inside. Like all cigar storage solution, acrylic humidors aren’t without their quirks. One notable issue is that new acrylic humidors may have a strong chemical smell. However, after leaving them open to air for a few hours, the odour tends to dissipate. Although acrylic absorbs more UV light than glass, it doesn’t filter it entirely. Therefore, care should be taken not to leave your humidor out under direct sunlight. Not only may sunlight discolour your cigars, but you may experience a greenhouse effect where the interior will heat up. Similarly, the humidor may be susceptible to temperature changes as acrylic doesn’t offer much in the way of insulation. Like wine, cigars aren’t particularly fond of heat and you may lose flavour if they endure too much. Furthermore, changes in temperature will have a molecular impact on the relative humidity inside. However, these concerns are not much different to those you’d expect from tupperdors and coolidors. Therefore, consider keeping your acrylic humidor somewhere with a consistent temperature that isn’t exposed to much light. As you may have noticed, there are few pitfalls when owning an acrylic humidor thanks to the airtight materials and low-maintenance. However, there are certain considerations to keep in mind when buying one. First and foremost, be sure to check the overall construction and the way the humidor is made. You want all the joints to be properly heat fused or thoroughly glued if it has been made from several parts. If it has been injection moulded, this is not a concern. However, poor gluing or construction may prove to have air gaps that let moisture escape. Next, the lid’s seal must be airtight. One of the reasons that we’re so fond of the Boveda acrylic humidor is that it features a magnetic locking system. This provides an excellent seal and is easy to use. However, most acrylic humidors will likely depend on rubber or mechanical seals. Therefore, you should check these thoroughly to make sure that they’re airtight. Similarly, make sure that the acrylic used is of high quality and thick enough not to break. Not all acrylic is the same and there are essential two types. The cheaper, weaker type is known as extruded or “continuous cast” acrylic. It’s softer and contains impurities as well as having a tendency to scratch. Meanwhile, cell cast acrylic is much more robust with a thicker and clearer appearance. Although it will be hard to tell from which acrylic humidors are made, you can get a good idea by feeling the weight and checking their transparence. As mentioned above, acrylic humidors will be sensitive to both light and heat. Therefore, be sure that you’ve planned ahead and that you know where you’ll be keeping it for safe storage. As mentioned earlier, acrylic humidors require very little maintenance. However, some new acrylic humidors may have a strong smell when they’re first opened. Nevertheless, all you need to do is leave the acrylic humidor open for a few hours. Eventually, the smell should leave on its own. When this has been done, they just require a humidifier and then they’re ready to use. That said, be careful of what humidifier you employ in an acrylic humidor. Since they’re very airtight, they can be easy to over-humidify. Therefore, you’ll need to make sure that you either use just the right amount or one that offers two-way humidity control. Most humidifiers only offer one-way humidity control, which means that they continuously release moisture. In fact, they continue to produce moisture even when the humidity goes above the desired RH level. Meanwhile, two-way humidification means that the humidifier stops releasing moisture at a certain level but actually absorbs any excess instead. 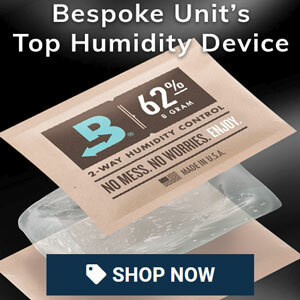 For this reason, we prefer Boveda’s humidity packs. Not only are they self-maintaining and don’t require recharging but they also offer two-way humidity control. They’re also compact and take very little space, which makes them ideal for smaller humidors. We particularly like using them with their own branded acrylic humidors as these are designed with a dedicated separator for storing the packs. 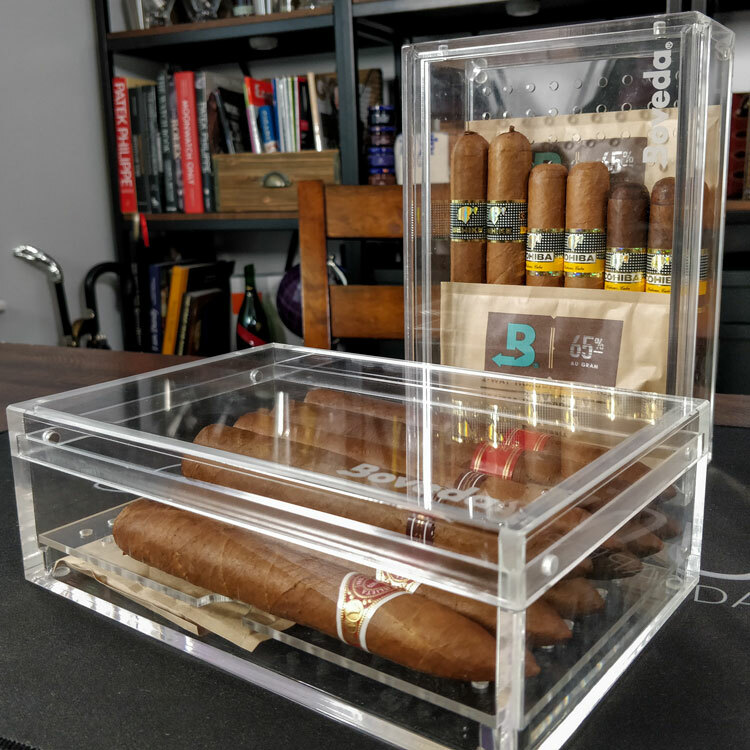 Boveda’s large acrylic humidor is easily the best option currently on the market. While it’s domed top prevents it from being stackable, it’s large size offers enough space for 75 cigars. With three humidity packs, the airtight seal will provide a year’s worth of moisture before they need to be replaced. Meanwhile, integrated magnets improve the quality of the seal with a neat locking mechanism. Furthermore, the handled tray means that you can easily replace the packs, which are stored separately. Designed with the same specifications above, this smaller acrylic humidor is great for creating a micro-environment for a special selection of cigars. The magnets improve the seal for year-long performance from two humidity packs. Capable of storing between 40 to 60 cigars, the Davidoff’s Zino acrylic humidor is certainly a premium choice. They’re available in either clear, blue or smoky grey and feature a handy compartment down the side for your humidifiers. This French-made humidor is sealed by a magnetic snap hidden in the metal Zino clasp. They’re often out of stock on Davidoff’s website due to demand. However, you could probably try your luck with premium brick-and-mortar cigar retailers. 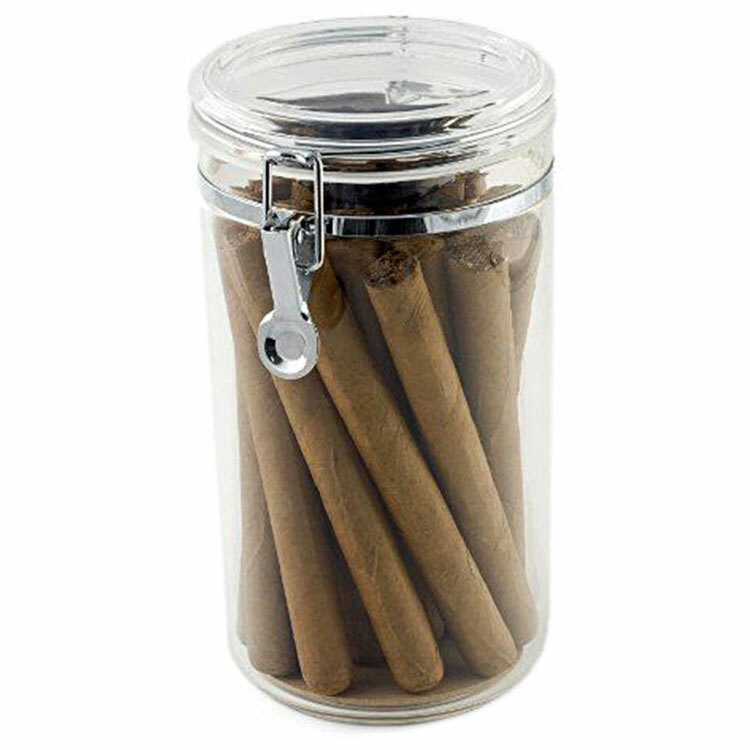 This cheap as chips acrylic jar is something of an old-school way of storing cigars. However, if you’ve got a very small collection and just want to keep them in an easy environment, it’s a great alternative to a tupperdor. A single Boveda pack should do the trick and you’re ready to go. Reviewed by Fabian D., on 26th October . "Something new to try! I hadn't heard of acrylic humidors and I'll be grabbing one from Boveda shortly!"